MIDTOWN — The sun would shine underground in a newly released design of a newer, smaller Donnell Library. The library branch, closed since 2009, would be an airy, tri-level glass-fronted space that goes three stories below street level, part of the 50-story Baccarat Hotels & Residences complex being developed by Tribeca Associates and Starwood Capital Group. "It's taken a long time to get to this day," said New York Public Library chief operating officer David Offensend, who helped present renderings of the proposed design to Community Board 5's education, housing and human services committee Monday night. "This is the future of the library." 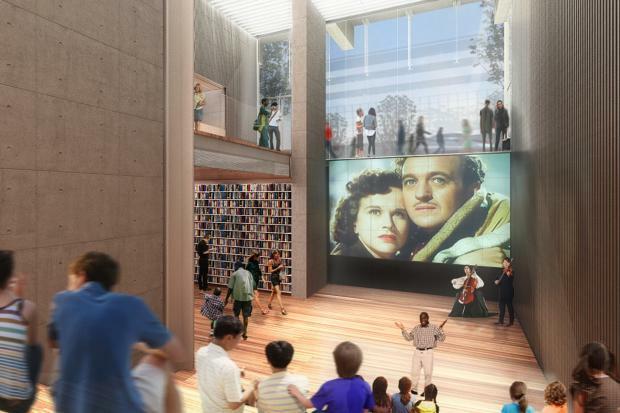 The library is being built with $20 million of its $59 million sale price. Expected to open by 2015, the space will likely feature large and small communal tables and a central computer hub. It would also include a 150-seat auditorium and, in its signature feature, a wide, tiered reading room with tiered terrace seating — similar to steps built at the Hamilton-Grange Branch — that will face the library's glass-walled entrance as they descend underground. Once completed, the library will measure about 28,000-square-feet — slightly more than half the size of the original Donnell branch, which spanned roughly 40,000-square-feet. "The building that was there before was considerably larger than the space we're going to," Offensend acknowledged. "We moved out a number of activities that were in the old Donnell that we have relocated." Donnell's children's, world languages and media collections were each moved to branches around Manhattan, where they have seen far greater demand, library officials said. Once the branch reopens, however, it will include programs for English-language learners, movie nights and children. "We expect to have a full complement of programming for all age ranges," said Kevin Winkler, the New York Public Library's deputy director of sites and services. Because the New York Public Library is an independently managed nonprofit, no action was required on the part of the board committee. It did not take a vote on the proposed design, which Offensend and others described as a "spatial study" as opposed to a concrete blueprint, and the board's members were careful to avoid offering any opinion on the plans. Members of the public who attended the meeting, however, voiced concern about or outright opposition to the library's proposed design. "This is a wealthier city, this is a larger city, and my understanding was Donnell was being sold to capitalize on value that could be gotten there by building a much bigger building," said Michael White, a Brooklyn resident and president of Citizens Defending Libraries. "Why wasn't this a bigger library, a better library, as opposed to a set of stairs to disguise the fact that it's being put underground?" Andrea Steele, a partner at TEN Arquitectos and the project architect for Donnell, emphasized that the design "maximized natural daylight and light and air," which "invites you to explore deeper and deeper into the project," which offered "quiet spaces where people can go have a more intimate moment" even as others worked together at large tables. A key goal, she and Offensend added, was to make the space flexible. "We want a space that is adaptable and can evolve over time," Offensend said. "We do not need rigid this, rigid that." When pressed by White to rate the library's redesign on a scale of 1 to 10, from "being a costly mistake" to "being an exemplary example of what we want for the rest of our libraries," Offensend described it as "closer to a 10 than a 1." "It's different, we appreciate that it's different," he said. "We think that it's important it continue to innovate and have spaces like this that can adjust to the changing needs of the users."